The first question often asked about the Bhagavad-gita is why was it spoken on a battlefield? Despite a common view that religion is a major cause of war, the general view is that the two should remain separate. Religion or spirituality should result in peace not conflict. If one’s spiritual practises bring about the bloodthirsty desire to eliminate the followers of some other faith then they must be suspect. That would surely seem to make sense. 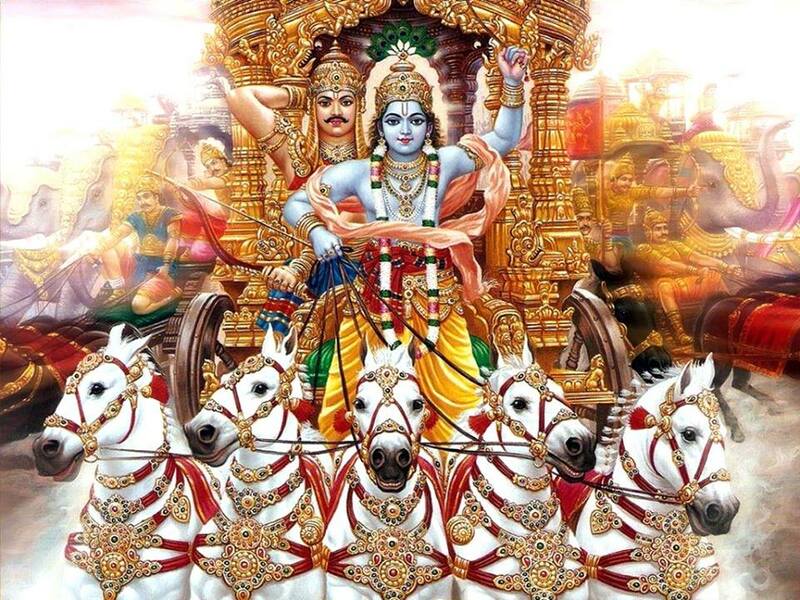 Nevertheless the Gita did arise from a war, the great Battle of Kurukshetra. Not only that, but its final message to Arjuna—a mighty warrior who had suddenly veered towards pacifism—was to give up his “petty weakness of heart” and sally forth to slay his enemies in battle. How then is it a religious text? Perhaps we should begin by defining religion. Dictionaries usually describe it as a system of belief in some supernatural power. That is where the conflicts tend to arise. My beliefs may well be different to yours, and human nature is such that we identify with these to the point where we create divisions based upon them. Hence we have many religious communities going under different names—Christian, Jewish, Muslim, Hindu, etc. In most people’s minds this is what is meant by religion, all these various designations. The Gita however gives a broader definition. In Sanskrit, the language of the Gita, the word for religion is dharma. This translates more accurately as the essential nature of a thing. In the case of a person this nature is to serve. We are always serving someone or something, be it our boss, family members, country, or maybe just our dog. We cannot avoid service. Even if we have no one to serve we will still serve our own mind and senses, which constantly demand satisfaction in one way or another. We cannot sit peacefully for very long before one bodily demand or another impinges upon us and we have to act to satisfy it. This is the message propounded by the Gita. It speaks of all beings as eternal parts of God having an unbreakable loving relationship with him. Arjuna’s dilemma as a warrior who was not inclined to fight was only the external context for a far deeper message than just getting him to take up his weapons. That message is encapsulated in the Gita’s key verse in the ninth chapter, where Krishna says, “Always think of me, offer me your respects, worship me and become my devotee. Surely then will you come to me.” This is the essence of all religion and it was what Arjuna had forgotten. He was thinking he had so many other duties which had all begun to seem onerous, conflicting and ultimately impossible. He got to the point where he did not know which way to turn or what to do. Krishna’s response was simple; just do what I want and you will be peaceful and happy. As it happened at that time Krishna wanted Arjuna to fight. After all, sometimes fighting and violence are required when there are disturbing elements in society. 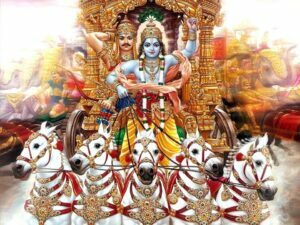 We need the forces of law and order, which was Arjuna’s duty, but that’s not the real point. The ultimate message of the Gita is not about fighting or any other specific kind of work. It is about surrendering to God, acting only for his pleasure, recognising that this is truly in our own and everyone else’s best interests. When Arjuna understood this point his dilemma was over and he became peaceful. “My illusion is gone,” he told Krishna. “I am now free of duality and prepared to do whatever you ask.” And as Krishna asked him to fight that very fighting became a pure spiritual activity that led Arjuna to the highest point of self-realisation. All of us are like Arjuna in so many ways. We stand on the battlefield of life faced with all kinds of challenges which often seem overwhelming. Sometimes we too don’t know which way to turn but the message of the Gita is also there for us. “Turn to me,” says Krishna. “I will always protect you and in the end bring you back to me.” That is the fight facing us all, turning from illusion towards Krishna, but with his help we like Arjuna will surely emerge victorious.